Betcoin CLOSED THEIR POKER ROOM on December 25th, 2017. They still offer sports betting and bitcoin casino games but if you want to play poker with crypto-currency then you should visit our poker page for a list of bitcoin friendly poker sites. 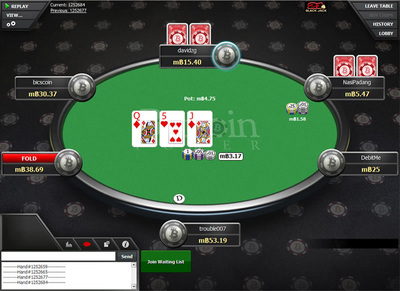 ﻿​﻿Betcoin is a bitcoin-only poker room that welcomes United States real money players. Betcoin shares tournaments with major sites like Americas Cardroom and Black Chip. Cash games are quieter with roughly 50 to 100 real money players at the tables. Sign-up anonymously in seconds with just a username, password and email address. Betcoin charge zero fees for deposits and withdrawals. Minimum deposit is 1 mBTC. Deposits are credited in minutes after 1 confirmation. Payouts are processed in hours. Betcoin does not fully support mobile poker but an iOS/Android app is coming soon. Rake is between 2% - 4%. 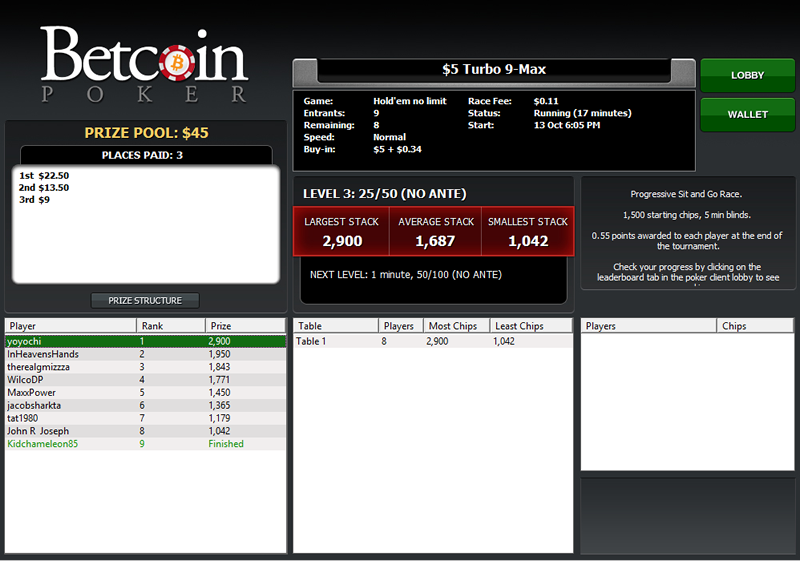 Start a new table and get 150% rakeback on hands played. Established in 2013, BetCoin has become the most popular bitcoin-only poker rooms, hosting more players and tables than any other site. 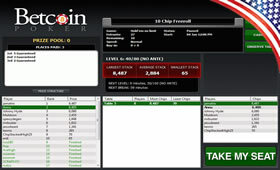 Operating out of Costa Rica, BetCoin is part of the Winning Poker Network (Black Chip & Americas Cardroom), a select group of sites that share both their player pool and the high-quality poker software that the Winning Poker Network is known for. Players from the United States are welcome. There are more tables to choose from at BetCoin than at any other bitcoin-only poker room. Cash games run in a variety of formats: No Limit, Fixed Limit and Pot Limit games are all available, as are heads-up, 6-max and full ring games, with buy-ins starting from as low as 1 mBTC and running as high as 50 BTC. Cash games are still relatively low-traffic with approximately 50 to 100 players at the tables but the numbers are steadily growing. Sit & Go’s are also available, with much the same range of structures and buy-ins. 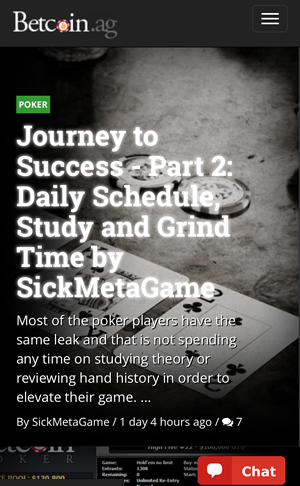 Best of all, though, are the tournaments as they share player pools with other major U.S. sites on the Winning Poker Network like Americas Cardroom, True Poker and Black Chip Poker. You can register for the biggest events in bitcoin poker like the weekly Sunday Special, where there is a guaranteed prize pool of $115,000 USD. 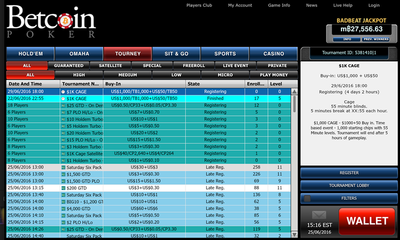 This sharing of tournaments means that player traffic is always high at the tables. You can also try out the other variants of poker offered by Betcoin like Omaha, 7 card Stud, 32 card poker and Telesina. Betcoin Poker uses the same software as other sites on the Winning Poker Network, making for an excellent playing experience on their felt. The in-game animations are smooth and the table display is graphically pleasing, allowing for customisable felts, decks and card colours. Multi-tabling is supported so you can keep the cards in the air if you are sick of waiting on a big hand, while the player chat feature keeps the communal element of poker intact. As well as the option to save hand histories, players may use the Game Replayer to watch back entire sessions they have played and review them. Betcoin also hosts a large amount of casino games: slots, blackjack,roulette and craps are all on offer, as well as live dealer games where you can bring the thrill of the casino to your home with live baccarat, keno, roulette and klackjack. A large sportsbook is also included, allowing for in-play betting on dozens of sports including football, tennis, and even eSports. Unfortunately, since the "Instant Play" software uses Flash you will first need to download a Flash enabled browser like Puffin (Free) from the App Store on iTunes or Google Play. A HTML5 mobile version will be available shortly that will work on any browser, including Safari and Chrome. 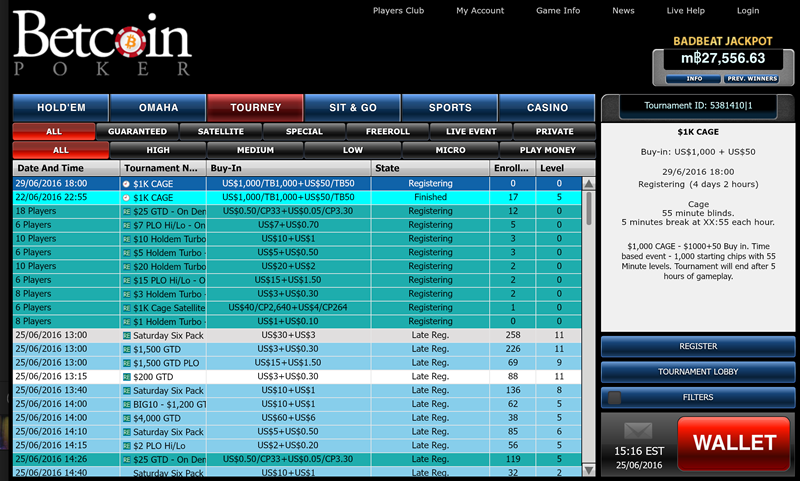 Registering for an account at Betcoin Poker only takes a few moments. Unlike at regular currency online cardrooms where personal details are often required to sign up, you only need to provide a username, password and email address to start playing instantly. Betcoin accepts both bitcoin and litecoin and only one confirmation is necessary before the funds appear in your player account. The minimum deposit amount is 1 mBTC and there no maximum limit imposed. Withdrawals are usually processed on the same day they are requested. There is no conversion fee incurred for using bitcoin, and litecoin is converted to bitcoin at the current market rate with no additional transaction cost. Betcoin Poker offers some of the most lucrative promotions around, including a 100% welcome bonus to first-time depositors on amounts up to 1 BTC. Players who start a new table will receive 150% rakeback on their hands played, keeping the many tables at Betcoin Poker in action. The VIP Player’s Club is a loyalty system that rewards regular players with rakeback bonuses of up to 50%, making it the most generous loyalty scheme on the market (rake is between 2% and 4% for cash games and 10% for tournaments). With daily freerolls where you can win bitcoin for nothing, the team at Betcoin Poker truly does give back to its players. Should you have any problems, support is available via a ticket system, regular email or you can speak to one of their support staff directly via Live Chat. Two-factor authentication using Google Authenticator can be enabled if you want to make your account extra secure. Betcoin is a solid option if you are searching for a place to play poker with bitcoin. They provide top class poker software (provided by the Winning Poker Network), huge shared tournament player pools and generous promotions and rewards for their players. Real-money players from the United States are welcome and anyone can create an anonymous account in seconds.